It's always amazing the way a theme emerges from almost every Shedman project. For some reason the theme of Shedman's sojourn in Ledbury has been 'river'. It started with David Whyte, described in the Festival programme as a ‘modern day shaman’. It continued with Gary, the forensic anthropologist and gathered pace with Margaret, the Festival Treasurer and bio-dynamic farmer. It flowed from Alison, the music teacher from Newbury and meandered through conversations with the poet Angela France. It found its path of least resistance, not surprisingly, in Tom Hogkinson of The Idler. Perhaps the river theme is no surprise given the fact that seven miles to the south, beyond Dymock, the River Severn flows towards the sea? Or that Herefordshire is the county of five rivers? Or because in 2007 Herefordshire, Gloucestershire and Worcestershire had seen the worst flooding for years? 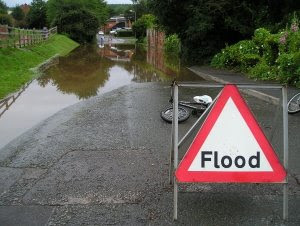 By 19 June, Herefordshire was affected by flooding. 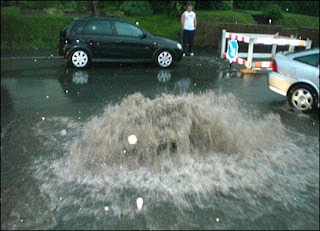 The M50 motorway near Ledbury was closed on 22 July due to flooding. Coca-Cola Enterprises Ltd said it was donating a quarter of a million 500ml bottles of its Malvern Water to Tewkesbury Council for distribution to the local community. Central Trains services between Worcester and Hereford are not running due to flooding at Ledbury in Herefordshire. Or because St Swithin's Day falls on July 15th? ‘Saint Swithun or Swithin (died 2 July 862) was an early English Bishop of Winchester, now best known for the popular British weather lore proverb that if it rains on Saint Swithun's day, 15 July, it will rain for 40 days and 40 nights. Whatever the reason for the river theme's appearance, its course through Shedman's time in Ledbury, like all the best rivers, took surprising and fascinating turns, as it wove a special magic through an extraordinary week.